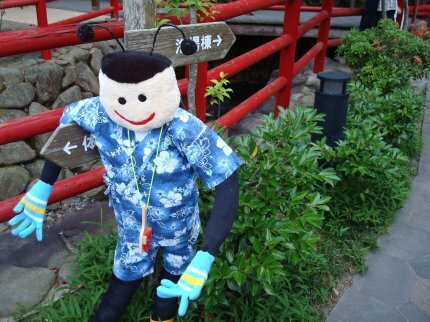 Every year Shionoe (塩江) hosts a festival in honour of the glowing firefly insects which appear in the area. 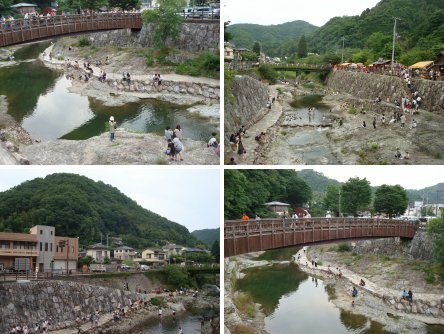 Shionoe is in the outer Takamatsu (高松) area of the Kagawa (香川) prefecture in Japan. The fireflies are found around the river area where the festival is held. In 2010 it was held on Saturday 12th June. This map shows the rough locations of Takamatsu’s Kawaramachi 瓦町 bus station (North pin on the map) and the Shionoe-cho 塩江町 firefly festival (South pin on the map). To get there we could either take the 53 bus from stop 4 of Kawaramachi bus station, or the same bus from stop 10 of the Takamatsu bus station (near the train station). The journey is about an hour, and for almost all the buses Shionoe is the last stop (be careful if you get on a bus where it isn’t!). When you get to Shionoe make sure you check how to get back – the buses back to Takamatsu usually finish quite early (around 7pm) but they should run later on Firefly festival day. Near to the bus stop were loads of pictures that local children had drawn of the fireflies. The festival area is only a few minutes walk from the bus stop. Just follow everyone else. You’ll need to go over the river on the small foot bridge. 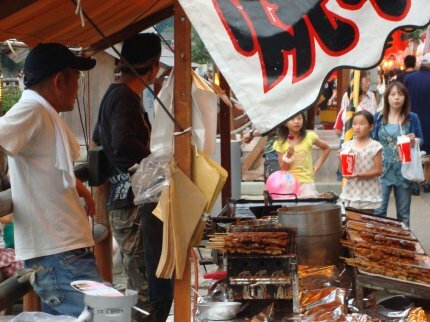 Inside the festival are lots of food stalls (plenty of meat, fish, ice cream, drinks, toys). And there was some kind of stage show, with what looked like people dressed as power rangers! One of the highlights of the festival is a chance to see some fireflies. They have a darkened tent that you can go in to see them. I think the tent opened at about 6pm, so that might be a good time to arrive at the festival. There was a big queue but it moved very quickly. First you go through one set of tent flaps, where it gets dark. And then you go through another set where it gets even darker. In here the fireflies are kept behind netting. You can see them flashing on and off with a green luminescence. They look a bit like little LEDs turning on and off. You certainly aren’t allowed to use flashes in here (I think it scares them – and it would ruin the atmosphere), but I was able to take some non-flash photos (I turned off the viewfinder so that my camera wouldn’t give out any light). Most of the photos were completely black, but in a few of the shots were small green dots. I’ve blown one of the dots up so you can see the colour! This is a fun little festival if you want to get outside the main city. I’d say you can see it all in about an hour – but you could stretch it to two hours if you ate some food, and did things slowly. This entry was posted on Thursday, June 17th, 2010 at 3:12 am and is filed under Japan. You can follow any responses to this entry through the RSS 2.0 feed. You can leave a response, or trackback from your own site.